Continuing yesterday’s post, here are some ideas for those of you who want to decorate your walls but are limited due to renting agreements. Today I’m going after a colorful, funnier look, but again, under a limited budget. I’m a big fan of Native American art, so I got to start with a beautiful cultural symbol from the Huichol people (from Western Mexico). It’s called the Ojo de Dios (meaning God’s Eye) and all you need is some sticks (at least two) and thread in different colors. For the basic steps you can see this how-to video and when you get the hang of it, go ahead and try this complex version. It’s stunning! Other project with sticks is this one on the free people blog where you paint it in bright colors to give a wonderful effect. And this bamboo chime is so vibrant that will remind you of warm sunny days even in the strict winter. To round up this post I choose a cute sweet project that I made recently for my little cousin’s birthday party. The result was amazing with so many different flowers all over the place! The original tutorial shows how to make a paper pom pom. To do the flower just use 4 sheets of paper instead of 8, and open to one of the sides only. Source: Free People, Michele Made Me, Sew Sweet Stitches and ModFruGal. First of all, I’m sorry for taking so long to write again. I’ve been Internet deprived for a few days and after that my sleep-deprived brain wasn’t able to put itself together to do anything. Last week, when I told my friend Abby about my blog, she put me up for a challenge. What can she do with four plain white walls in her rented house? They can’t be painted and the idea is to be as low-cost as possible. So I picked a few DIY projects that could make that trick! Since they were too many for just one post I’ll put some today and the rest will be up tomorrow. So, I’m gonna start with a few ideas involving photos. Frames: I think everything gets prettier with a nice frame, but cheap wood frames are hard to find. So why not making your own? One option would be using fabric and cardboard (using an old cereal box, for example) to make some frames. You can also make paper frames using some scrap paper or a thicker kind of paper, like the ones you can find in this design*sponge DIY or this one made by the free people girls. Collages: Instead of framing it, you can also put all pictures together like this cute heart made with deer pictures. And it can be transformed in any shape! It’s actually a very good idea for a birthday party. And to make it more interesting, use Instagram to do some retouch on your photos. If you don’t have and iPhone/iPad, you can use Picnik which has some great editing tools. My favorite thing about blogs is the DIY tutorials that I came across. Very fun ideas with extraordinary results and sometimes you can do it with things you can find at home. So I decided that, each week, I’ll resume some of the best tutorials I come across and maybe even come up with my own how-to projects. 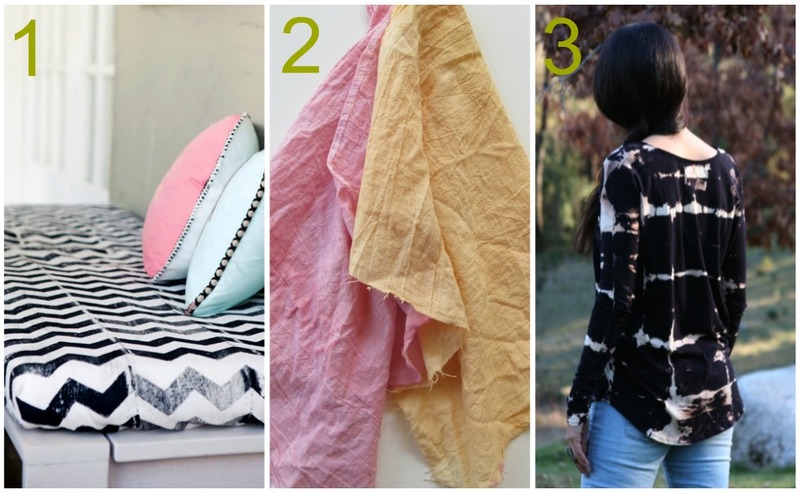 So this week it’s all about fabrics and three projects that will make you swoon. 1. Chevron Fabric – Jaime from Prudent Baby shared her inexpensive and simple block-printing method that she used for the chevron fabric on her backyard bench. I love the chevron pattern but I wonder what other patterns can be done. 2. Natural Dye – Blackberries, beets and yellow onions are only a few of the things that the girls from the Free People blog used in their natural dye experiment. It’s a bit tricky but I find the results really worth it! 3. Bleach Tie Dye – This tutorial from Honestly…WTF is probably the quickest of all although it must be done outside (which is a bit hard if you live in an apartment like me), but the result is amazing!